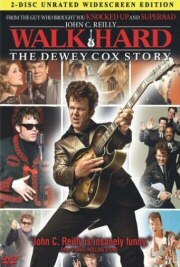 alk Hard: The Dewey Cox Story” is explosively funny and positively maddening. Musical biopics have been begging for a good thrashing, so the movie has an unlimited number of jokes at its disposal. The problem is that the movie careens between “This Is Spinal Tap” genius and “Scary Movie” pandering, sometimes within the same scene. In their attempt to tell every joke available to them, they forgot that some of them are not worth telling. Much like the movie “Once,” it’s a pity that the jokes didn’t live up to the music. The songs of “Walk Hard,” written by a veritable murderer’s row of songwriters such as Marshall Crenshaw, Mike Viola, Dan Bern and even Van Dyke Parks, are spot-on parodies of Johnny Cash, Roy Orbison, Bob Dylan and Brian Wilson (one guess which song Parks co-wrote), and Reilly does a surprisingly good impression of the golden-throated Orbison. Fischer’s singing voice, on the other hand, clearly belongs to someone else (Angela Correa, to be precise), and while she looks every bit the stereotypical innocent temptress, her “singing” scenes fall flat. It’s a given that “Walk the Line” and “Ray” are the main targets here, and those two movies alone offer plenty of ammunition to anyone ready to put biopics in their place. Some of the jokes are sublime: the scene where Dewey walks in on his drummer (Tim Meadows) trying the latest drug, which becomes a running gag throughout the movie, is genius, as is Dewey’s literally destructive behavior whenever he has a meltdown. Why, then, could they not come up with a better manner for dealing with Dewey’s love for Edith and lust for Darlene? (I won’t give it away here, but trust me, the way it comes to a head is cheap and easy.) There is also the matter of the record company executives. It’s both a glorious middle finger towards political correctness and incredibly tacky at the same time. Your personal results may vary. “Walk Hard” might also set the record for casting nepotism. Judd Apatow produced the movie, and he stuffed it to the gills with his regulars including, but not limited to, Reilly, Wiig, Paul Rudd (who does a hilarious John Lennon), Jack Black (who does a terrible Paul McCartney), Jane Lynch, Jonah Hill, Chris Parnell, and Martin Starr. There is also a Dewey-freaks-out scene that appears to have been written with Will Ferrell in mind. Ferrell may have pulled off that scene more convincingly, but his Shake & Bake partner Reilly was the right call in every other regard. For all of the mistakes that “Walk Hard” makes – and it makes plenty – the movie hits too many right notes for the sour notes to drag it down. Yes, there are obvious jokes to make when poking fun at a biopic, but just because the joke is there does not mean you have to tell it. Note to any aspiring parody writers out there: choosing which targets to hit, and taking them down, is much more effective than throwing a bunch of junk against the wall to see what sticks. Given the hit-and-miss nature of the movie itself, it is a great pleasure to discover that the extra features to “Walk Hard” are exceptional. There are two versions of the movie; the theatrical release and the appropriately titled “American Cox: The Unbearably Long, Self-Indulgent Director’s Cut (it’s a whopping 24 minutes longer). The featurettes are immensely entertaining, especially the one where everyone espouses the greatness of the “real” Dewey Cox (Sheryl Crow talks of sleeping with her entire eighth grade class in honor of Cox). The extra footage is all genuinely funny, and the audio commentary featuring Apatow, Jake Kasdan, John C. Reilly and producer Lew Morton is hilarious. Music fans, do not pass this up.